"We may not have forever together, but we have right now." Delia Wilkes and Josie Howard are best friends, soon-to-be-graduates, and local Jackson, Tennessee celebrities (okay, so I use that term loosely). Delilah Darkwood and Rayne Ravenscroft - as they are otherwise known - host Midnite Matinee, a campy public access show that screens terrible B-rated horror films culled from the depths of obscurity (and the '80s, or so one would assume), performing cheesy skits before, after, and during. Though it's what brought them together, the show means very different things to each young woman: for Josie, it's a doorway into a career in tv; for Delia, it's a way of reaching out to her absentee father, who abandoned Delia more than a decade before, leaving her family in ruin. The tapes she diligently combs through every week? Belonged to her dad, the man formerly known as Dylan Wilkes. With the end of high school barreling down on them, Delia and Josie have plenty of tough decisions to make - not the least of which involves the future of Midnite Matinee. Josie's parents are leaning on her hard to enroll in Knoxville, so she can take that Food Network internship her mom lined up for her. But moving away from Jackson will mean leaving Delilah Darkwood and Rayne Ravenscroft - and Delia herself - behind. And then there's Lawson, the handsome MMA fighter who's slowly but surely worming his way into Josie's heart. The girls hatch a plan to 'take Midnite Matinee to the next level,' involving a road trip to Orlando, a horror con, and an eccentric Hollyweird type name Jack Devine. Spoiler alert: things go sideways, as they tend to do. Typically Zentner writes pathos with a little bit of humor sprinkled in; Rayne & Delilah's Midnite Matinee is the inverse. While I think he's at his strongest in the former (and the heavy scenes are indeed my favorite bits here), the latter is still entertaining too. And now if you'll excuse me, I have a season of Mystery Science Theater 3000 to binge watch. I need some laughs, okay. 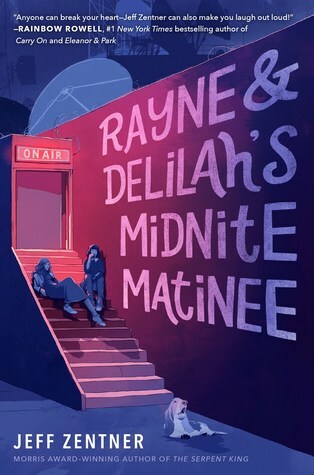 Sign into Goodreads to see if any of your friends have read Rayne & Delilah's Midnite Matinee. 98.0% "Bufie, JFC. It's always the dog that destroys me. Glad I decided against reading the last 15 minutes of this book in public, because I am a hot mess right now."